In case you didn’t know, wild steelhead are threatened in most places and endangered everywhere else, except for those places where they no longer exist. And also, ironically, the sport of steelhead fly fishing has, in the past century, become logarithmically more popular. We’ve now got several publications devoted to the pursuit of this most majestic of all game fish with the fly rod. The sales of two-handed rods, used almost exclusively for the pursuit of this quarry, have exploded. 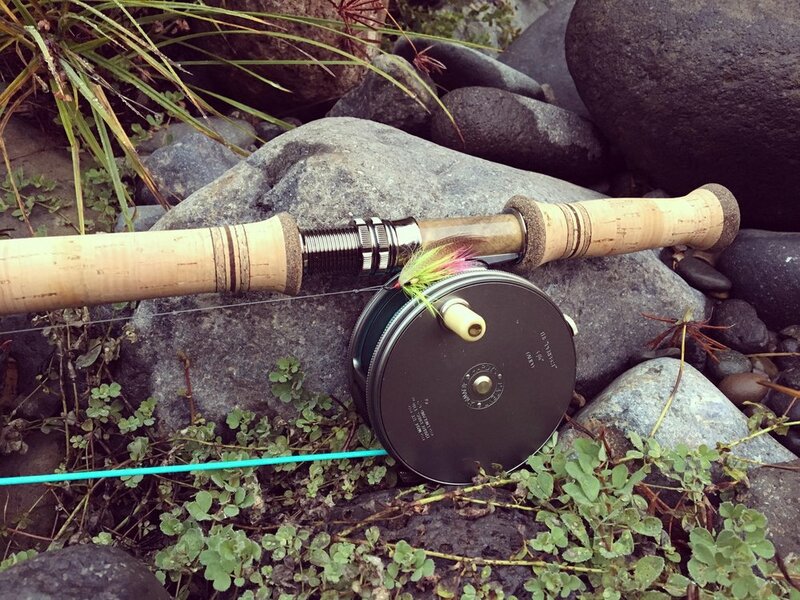 There is a ballooning market for both vintage and new versions of the old noisy reels that devoted steelhead fly fishers prefer. And we’ve got fewer steelhead. That’s bad. And ironic. So next year, when we are looking back on what caused wild steelhead to disappear off the face of the earth, we may point to the clear-cutting of timber. We may point to genetic degradation from the hatchery system. We may point to dams blocking spawning territory. We may point to the fact that dumping huge amounts of carbon into the atmosphere for a couple of centuries has in no way whatsoever had any effect on the climate, and that the increase in global temperatures we are currently enjoying conveniently is purely accidental and has nothing to do with us. We may and probably will point to a good many things. We may even point to ourselves as anglers and cite the impact that we had as being significant to the disappearance of steelhead. And just on the Glass House Principle we should do this. By participating in our noble sport we impact fish in the same way as participating in driving a car in no way impacts the climate. So, since I plan to not give up fly fishing for steelhead, what then should we do? Here is my sure-to-be-very-unpopular proposal: We need to mandate that the only acceptable way to pursue steelhead is by swinging flies. Before you skewer me through the wishbone with a junkyard pitchfork let me flesh out my proposal to its full redolent and coruscating glory. Firstly, swinging flies requires commitment from the angler. It is hard to do. Unlike having a guide use his drift boat to drive your bobber down a promising foam line, swinging a fly requires that you to learn to cast. And as a fly fisher you should embrace this. Because, contrary to modern usage, fly fishing is a casting sport. Otherwise, it’s hard to explain all the time, effort, and expense, that goes into designing the best rods for this very purpose. Secondly, swinging flies for steelhead continues the grand historical tradition of aristocratic British Atlantic salmon fishing. And who doesn’t want to associate themselves with the traditions of the upper-class of Old Albion? Well, maybe me, but in fact, we have our own great and rich West Coast fly fishing history and traditions that only owe their genesis to the English, not their substance. We’ve got the great flies of our history: the McGintys, the Bosses, the Hiltons, the Red Ants, the Skunks, the Brad’s Brats…the list is as huge as my hands. We’ve got the great masters of our steelhead fly fishing history. We’ve got the Roderick Haig-Browns, the Alec Jacksons, the Karl Mausers, the Wes Drains, and on and on. They didn’t fish bobbers. They swung flies. They crafted beautiful flies meant to be swung. Thirdly, and probably most importantly, the technique of swinging flies for steelhead isn’t about catching the most steelhead possible, it’s about catching a steelhead in the best way possible. It promotes what is best and most important about our sport. It promotes the attempt to master a difficult and artistic skill that lies at the core of what we do, using a weighted line to propel a relatively weightless lure. It promotes respect. It’s already been done. Look at the regulations on the North Umpqua. The regulations there promote good fly fishing. And limit impact. Or, conversely, look at the Rogue. Twenty-odd years ago the fly fishing season there, September and October, meant, among other things, that you could not fish from a boat. Due to the lobbying of some pernicious local fishing interests, and the unfortunate advent of the Almighty Indicator, that particular regulation, the regulation of not fishing out of a boat, was redacted. Now during the “Fly Fishing Season” on the Rogue, conventional tackle guides drive bobbers down the runs under which “flies” that weigh more than a Daredevil spoon dangle. Not really fly fishing. Furthermore, and on good inside authority, many of those guides are instructed by their employer to, when encountering an actual fly fisher swinging through a run, anchor their boat in the run just below the angler to prevent that angler from continuing to fish the run! This is not hyperbole; it has happened several times to me and to my friends. So, if you think about it, a steelhead fly fishing special regulation that allows bobbers to be used actually promotes bad etiquette in addition to bad fly fishing technique. A special fly fishing regulation needs to promote actual fly fishing technique. Now, that’s all I need to say, but let me continue. The next time a fellow angler says, “I landed 13 Steelhead today”, your response should be “I’m sorry. That’s a shame”, cause he probably did something untoward to do it. Ultimately, this discussion may be like arguing about which head of Cerberus, the three-headed dog guarding the gates of hell, you should feed first: Cerberus is a mythical beast and so to may become steelhead if we don't start doing something now. I propose that the least thing we can do is to only swing flies for steelhead. If that goes inordinately well, bring a few flies cut at the bend of the hook and keep casting.